The Volvo engineers were also generous when it came to technology. The 9-inch touchscreen display keeps everything you need within arm’s reach on the console. Apple CarPlay and Bluetooth technology keep you connected while you are on the road. A graphic heads-up display lets you keep your eyes on the road. 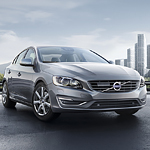 This is only a sampling of the amenities available with the Volvo S60.